While the California drought is front and center in today’s headlines, it is a longstanding issue that requires careful planning, coordination and innovation to manage the impacts to the environment and population. Groundwater has historically been viewed as a key component to fighting a drought. Surface water properly managed through storage during the wetter years is a vital source, but groundwater has aided California through numerous droughts in its history. However, much attention needs to be paid to the management of our essential groundwater supply. The Orange County Water District (OCWD) has taken steps to further improve the basin replenishment with the Groundwater Replenishment System (GWRS), a partnership between the OCWD and the Orange County Sanitation District (OCSD). 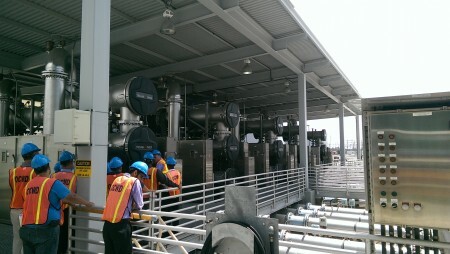 On Thursday, April 2, 2015, attendees of the Orange County Environmental and Water Resources Institute (OC EWRI) Technical Luncheon went on a tour of the new OCWD water purification facility. The presentation and tour was given by Mike Markus, the General Manager of OCWD. The 45 minute tour went step by step on how the treated discharge from the OCSD was further purified and used to replenish the groundwater supply. 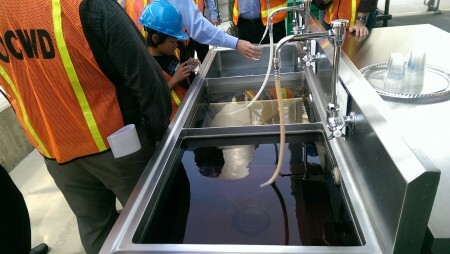 When all was said and done, each of the attendees had a chance to taste the water they initially saw enter the plant (treatment process also takes about 45 minutes from start to finish). The 3-step purification process begins by treating the water through microfiltration. The initial water has already gone through this treatment process at OCSD but needs further treatment to meet the potable water standards required. Microfiltration removes bacteria, protozoa and other suspended solids through 0.2 micron pores. After initial filtration, the process then continues to the main reverse osmosis system. Treating 70 MGD, this advanced system removes dissolved minerals, viruses and organic compounds from the water. A pressure range of 150 – 200 psi is required to move the water through the 3 stage (74-48-24 array) system. The final stage of the treatment process is the Ultraviolet Irradiation System. This low pressure, high output lamp system destroys any trace organics that may be left in the purification process through the use of hydrogen peroxide and UV light. After this stage the water is so pure that small amounts of minerals are added back into the water to avoid leaching of metals and other materials from pipes at the plant and during transport. After treatment, half of the water (35 MGD) is pumped to injection wells that serve as a barrier to seawater. The other half (35 MGD) is pumped to recharge basins managed by OCWD, located in north and central Orange County. The objective of the recharge basins is to allow the treated water to seep into the ground, filtering through the sand and gravel, and ultimately help replenish the groundwater aquifers. Benefits of the project are numerous including; a pure realizable supply of water for the protection of the aquifer from salt water intrusion, increased recharge of the aquifer, a treatment process more economical than desalination and imported water supplies, improved water quality of the groundwater basin and reduced wastewater discharged into the ocean. OCWD is currently putting the final touches on a 30 MGD expansion of the facility and sees a bright future ahead. With 1.3 billion gallons of treated wastewater lost to the ocean each day, it seems that this is only the start of this type of innovation.